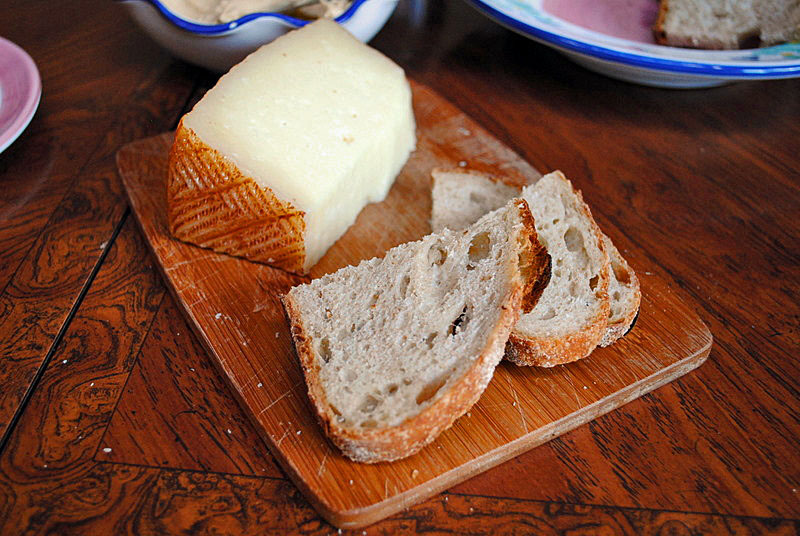 This bread closes a personal saga with a long-awaited happy ending. 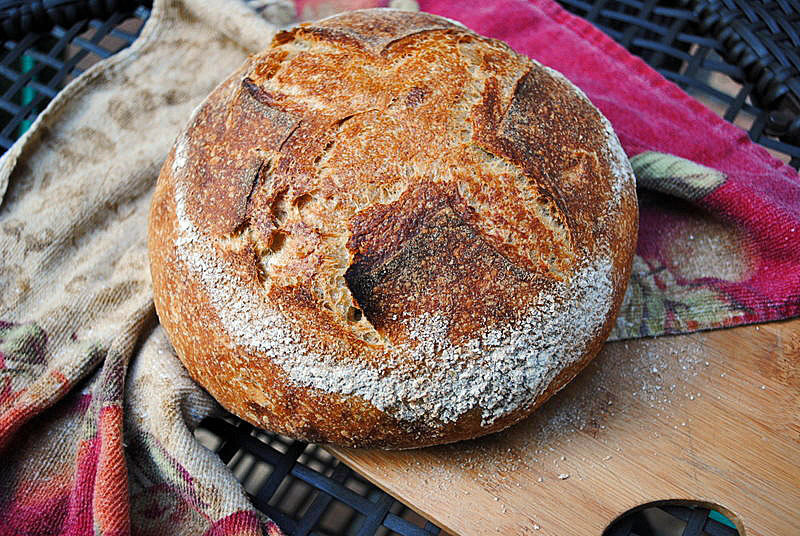 Since we moved to LA I’ve been searching for a way to bake the bread we enjoy the most: the rustic sourdough boule. When you only have a small electric (toaster) oven, baking this bread becomes tricky, to say the least. After 11 unsuccessful attempts, I finally conquered my virtual Mt.Everest and stuck my flag in the summit! Pour the water into a bowl, add the sourdough starter and dissolve it. Add the flours and the salt, then roughly mix all the ingredients together to form a shaggy mass. No need to incorporate it as a smooth dough at this point. Cover the bowl and let it stand for 20 minutes at room temperature. Remove the dough from the bowl and place it on a smooth surface rubbed with a small amount of vegetable oil. Quickly knead the dough for 20-30 seconds, incorporating all the dried bits of flour that are clinging to it . Wash the bowl or transfer to another, clean bowl, cover with a plastic wrap and leave at room temperature for 45 minutes. Remove the dough from the bowl, add to the kneading surface (slightly coated with oil if needed), knead for 20 seconds (second kneading cycle). Place the dough back in the bowl, leave it resting for 45 minutes more. Proceed with a third kneading cycle, place the dough in the bowl for 1 hour. Remove the dough from the bowl, shape roughly into a ball, let it rest 15 minutes, and form it into the final shape, making sure to generate good surface tension. Place the ball, seam side up, in a well floured round basket and let it rise at room temperature for 3 hours. Forty-five minutes before baking, heat your oven to 450F with a round pizza stone inside. Invert the dough over a piece of parchment paper on a peel or cookie sheet, slash the top with a razor blade, and place in the oven. Position a Dutch oven inverted on top of it (fill it with very hot water, then dump the water and use it to cover your bread). Bake covered for 35 minutes, then CAREFULLY uncover the bread and bake for 25 to 30 minutes more (or until internal temperature is over 200F). 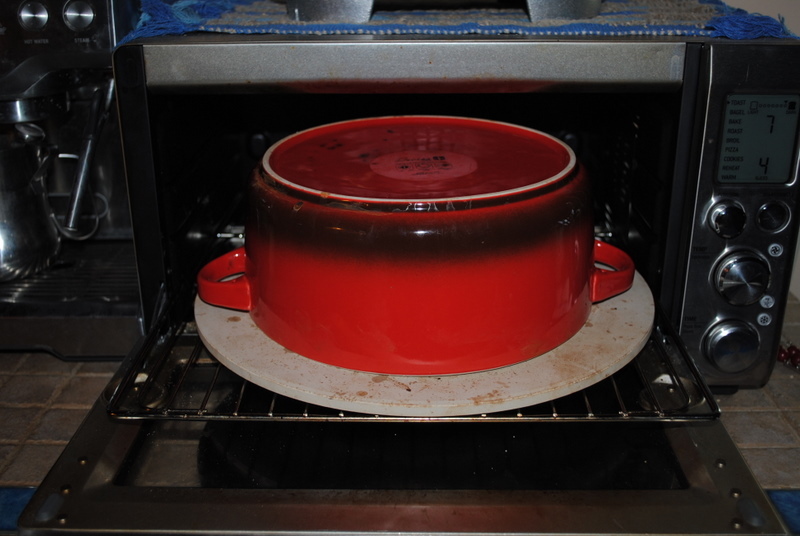 If the top browns too much lower the temperature to 425F, and cover the surface with aluminum foil. Comments: I’ve baked many breads in the past 3 years, but none gave me the thrill of this one, because it was my very last attempt! I was ready to throw in the towel and conclude that a rustic sourdough cannot be done in the nano-kitchen. What made it possible was creating the correct enclosure to bake the bread for the first 30 minutes. For our Breville, a round pizza stone and a Le Creuset-wannabe (found at a Ross store a couple of months ago) served the purpose quite well. Normally I’d add a small amount of rye flour to the dough, but I couldn’t find it last weekend, so I used only regular whole-wheat. This is probably the largest bread you can bake in a Breville, and I intend to try a slightly smaller version in the near future. I used regular kneading for this bread, but made a second loaf a couple of days later folding the dough instead, with similar results. You can use whatever technique you feel most comfortable with. Variation: Follow this recipe to the point of the final shaping as a “boule,” then retard it in the fridge overnight. Next day, bring it to room temperature 2 hours before baking.